Are you looking for that perfect home? Did you know that using a Real Estate Agent to help you find your dream home doesn’t cost you a thing? That’s right! The Seller pays all commissions! Real Estate Agents have a conversation at their listing appointment with sellers to discuss payment for the Realtor that brings them a buyer for their house. 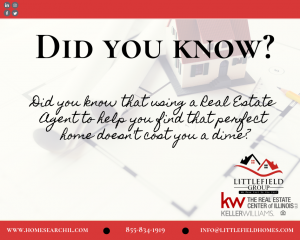 Be sure you take advantage of having a professional help you through your home buying process to make things easier and to ensure you have a great experience the right way!